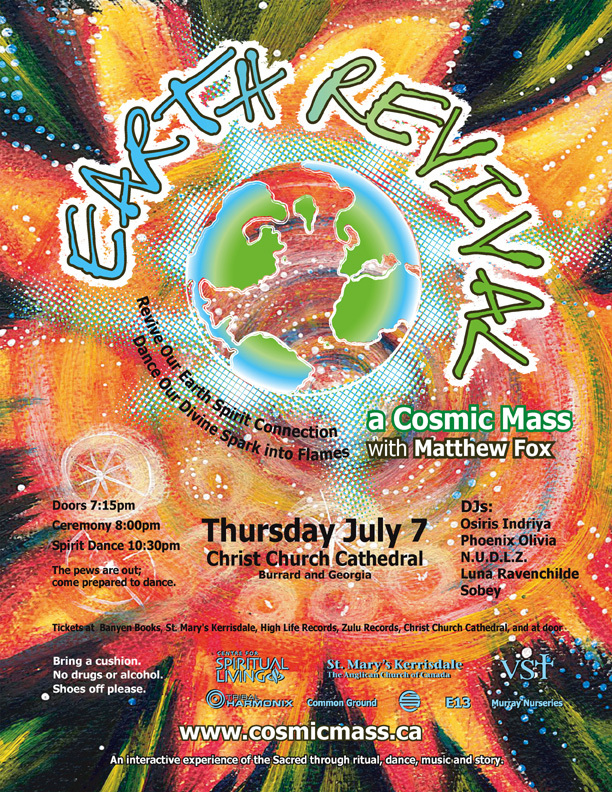 In 1971, radical theologian and best-selling author Matthew Fox developed the Cosmic Mass at the request of a group of young rave enthusiasts, after visiting their Planetary Mass in Sheffield, England. The goal was to establish an ever evolving worship experience that would enliven body, soul and spirit in a context of deep community celebration through the medium of dance and postmodern artforms such as DJ, VJ, rap, rave, and more. 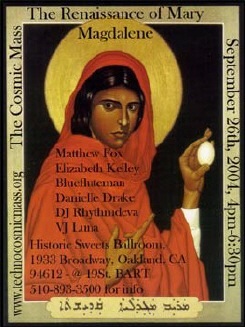 In 1995, Fox and his students spent a year meeting regularly with members of the Bay Area rave community in preparation for launching the Cosmic Mass (then called the Techno Cosmic Mass) in the U.S. in 1996 and subsequently presenting it in Oakland, with the active support and encouragement of Jerry Brown, former presidential candidate and later mayor. The first director, Jill Martin, was a non-clergyperson who had worked in the film industry in Los Angeles and recently graduated from our ICCS program with her thesis focusing on ritual. She was a brilliant launcher of the TCM revolution in worship and continued in the job for several years. The Cosmic Mass in the U.S. has been transparent from the start, with never a hint of a scandal. Another notable response came during the first Cosmic Mass honoring African Diaspora. We had danced to slides of the great black contributors to culture—singers, dancers, scientists, preachers, and more—during the first dance, which is always a Via Positiva Dance. Then for the Via Negativa we heard the stories of the middle passage and prayed together ancient spiritual songs of lament. Following the Mass a black leader in Oakland came up to me and said, “This is the first time in my life I have felt that white people were truly listening to our story.” What a lesson there is in this testimony! Ritual can be the way we go into our hearts to hear one another’s stories. 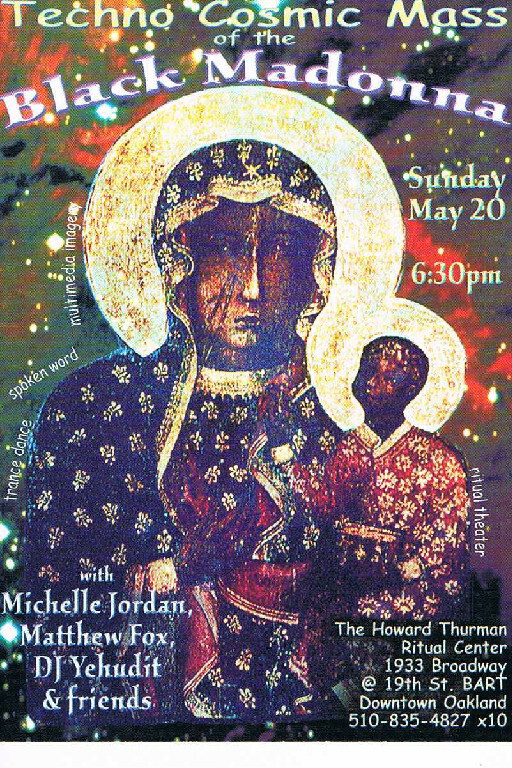 Since then, Matthew Fox and his students and alumni have celebrated over one hundred Cosmic Masses with progressive and interspiritual organizations including the Parliament of the World's Religions (Salt Lake City, 2015); a Mass at the University of Colorado, along with 1400 participants (2013); a Sounds True reterat in the Rocky Mountains of Colorado with more than 1000 participants; and with Michael Beckworth's Agape Church in Los Angeles. A great number of Cosmic Masses have been held in Oakland and San Francisco, where the TCM originated, but the ceremony has taken place in many other cities in the U.S. and abroad as well, including Houston, Texas; Seattle and Portland, Washington; Ashland, Oregon; Madison, Wisconsin; Lexington, Kentucky; New York City and upstate New York; Kansas City, Kansas; Asheville, North Carolina; Cleveland, Ohio; Washington, D.C., Vancouver, British Columbia; and more.